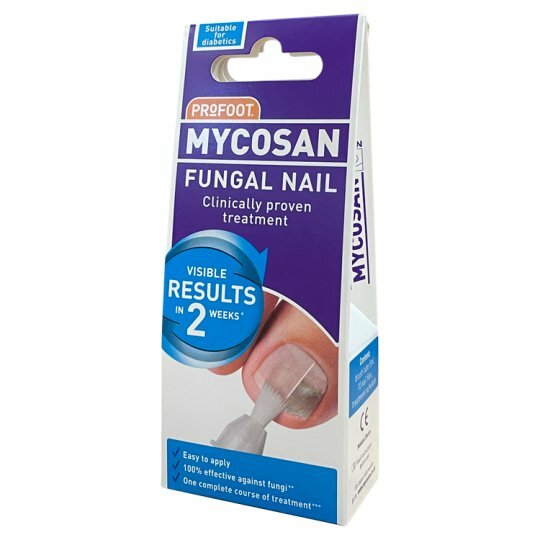 Mycosan treats and prevents fungal nails. The treatment set consists of a patented serum in a handy brush tube, 10 nail files and a treatment schedule. * 92% of participants of a consumer research in 2011 noticed improvement of the nail surface within 2 weeks. ** In 100% of participants in a clinical study in 2011, with a mild to moderate form of fungal nail, none of the fungi that can cause fungal nail [Tricophyton rubrum, Trocphyton mentagrophytes, Candida albicans] were found after 90 days. *** Treatment for one big toenail or multiple small nails simultaneously during 3 months. Part of the Profoot range of footcare solutions. Directions: Apply twice a day for 4 weeks, thereafter once a day until the affected area has grown out. For a faster and optimal result carefully file down affected area with accompanying nail files once a week. Take care! Gently squeeze tube. For external local use on nails only. Close the tube securely after use. Keep out of reach of children.